5-Sterne-Ranking Empfänger von 8 Passagier Choice Awards und 9 Excellence Awards. Empfohlen von Lonely Planet. Casa Bambu ist eine von vier Bambus Strandhäuser auf unsere sechs acre Resort Eigentum. (Wenn Casa Bambu die Termine reserviert Sie möchten, finden Sie den Eintrag für Casa Linda, Casa Sonrisa oder Casa Pina.) In der Casa Bambu unsere Mitarbeiter vor Ort ist 24/7 erreichbar. Costa Rica Ferienwohnungen: es gibt Hunderte zur Auswahl. Und doch sind wir immer wieder gesagt, dass Casa Bambu und unseren anderen drei Bambus Strandhäuser sind außergewöhnlich. Also, wenn Sie bereit sind, einen Spaziergang auf der wilden Seite zu nehmen sind, ist hier genau richtig! Diese Costa Rica Strand Vermietung bietet Naturliebhabern einen idealen Urlaub. Es liegt an einem wunderschönen Strand, in den Regenwald, an der Küste der Halbinsel Osa. Diese einzigartige Einstellung können Sie die wahre Costa Rica, eines der schönsten Gebiete auf der Erde zu erleben; entspannen Sie am Strand; und genießen Sie unzählige Naturwunder. Während dieser ganzen Zeit, damit Sie bequem und sicher in einer privaten Ferienhaus am Strand. In der Casa Bambu die Meereswellen den Schlaf wiegen und das Brüllen der Brüllaffen geweckt Sie zu einem herrlichen Sonnenaufgang über dem Golfo Dulce (Sweet Golf). Eine unberührte Strand ist nur ein paar Schritte entfernt, und der Regenwald und Wildtiere sind überall. Wenn Sie die Natur in ihrer wilden Schönheit lieben, ist dies der Ort für Sie. Nach dem Besuch Vermietungen um Land, empfiehlt Lonely Planet Costa Rica Casa Bambu als Ort zum Verweilen. Herrenblatt wirbt Casa Bambu in seiner Rezension von Costa Rica Ferienwohnungen in seinen Urlaub Leitfaden Titelgeschichte Wie überall Rent a Dream House: Ihre eigene Private Resort. Er sagt: "Für den Dschungel Erfahrung finden Sie auf der Halbinsel Osa, wild südlichen Anhängsel von Costa Rica. Seine wenigen befestigten Straßen führen zu winzigen Fischerdörfer, wie Cabo Matapalo, wo Sie unberührte Strände und Vermietung von Häusern, wie Casa Bambu auf einem Grundstück von unberührten Regenwald voller Affen zu finden. " Die Denver Post Reise Abschnitt vorge Casa Bambu in einem Artikel über Costa Rica, der Halbinsel Osa und Matapalo. Die Fine Living Kanal enthalten Casa Bambu in sein Programm um die Erde in achtzig Häuser, die auf bemerkenswerte Ferienhäuser in der ganzen Welt ausgerichtet, darunter Casa Bambu. Die Sunday Post von Schottland, eine internationale Publikation, einen Artikel von einem Casa Bambu Gast über ihren Urlaub bei uns. Eine perfekte Lage: direkt an einem wunderschönen Strand (in der Nähe und einige andere), mit einer spektakulären Aussicht, in den Regenwald, durch reiche Tierwelt und Landschaft. Eine handgefertigte, sauber und sicher Ferienmiethaus, aus dem Sie Ihre fantastischen Umgebung. Viele Aktivitäten für die ganze Familie. Drei weitere Bambusverleih, ebenso wunderbar. Wenn Eingeborenen von Costa Rica begrüßen sich, sagen sie oft "Pura Vida" oder reines Leben. Wenn Sie Casa Bambu besuchen, werden Sie wirklich verstehen, was das bedeutet. Wir befinden uns direkt am Strand von Pan Dulce, einem der besten Surfspots der Welt, um Surfen zu lernen. Bequeme Möbel, Landschaftsgarten mit Blumen, tropischen Obstbäumen, Rasenflächen fegen bis zum Strand vor, Solaranlage mit 110 Volt, Warmwasser-Dusche, Innen- und Außenduschen, Hausmeister / Manager vor Ort. Weltklasse-Vogelbeobachtung, vier Affenarten und viele andere Tiere in Hülle und Fülle. This trip fulfilled a lifetime dream for me to visit the rainforest. Casa Bambu was the perfect home for my 21-year-old daughter and me , as we took our daily journeys to Corcovado or spent the morning on the Golfo Dulce. The house was very well appointed with a full kitchen, 2 bathrooms, and great indoor-outdoor living so that we could spot wildlife while prepping meals or resting after a day's adventure. Kirk (owner) was extremely helpful and our guide William spotted a wide array of animals on our day in Corcovado and around the neighborhood, including two sloths on our last day! The Playa Dulce was right outside our door and across the lawn, and we spent a lot of time hiking the beach and just relaxing and swimming. I strongly recommend this home! Adventures in paradise from Casa Bambu! We stayed in Casa Linda with 6 people. Great accommodations, well described, and such an amazing location. Kirk arranged a boat trip on the Golfo Dulce for snorkeling and dolphin watching. We went on a night beach hike with William to try to see turtles (only the brilliant stars and a quarter moon out that night, but many nests and tracks were sighted). This off-the-grid house has an amazing view and is steps to a lovely beach. Great showers, good wifi, and so many birds. A beautiful home away from home - on a beach! We (2 adults, 2 teenage kids) spent a week at the beautiful Casa Bambu, to end a 2 week trip in Costa Rica. Everything was amazing - from Kirk's helpful emails before the trip, to the house itself, to the beach and so on. We went on an incredible hike in Corcovado with William, the house manager, and also on a night hike near the house where we saw an ocelot. Pretty incredible. I highly recommend going on some hikes with William, he is a treasure - kind and very knowledgeable. We did the boat tour of the gulf and saw whales and dolphins, and had a great time horse riding to the waterfall. The house is clean, comfortable and easy to live in. We did all the cooking ourselves because (a) we like to cook and it's a great kitchen and (b) I caught so many fish from the shore that we had plenty to eat! We saw Kirk a few times while we there, and he is a fantastic host - very pleasant and always on hand if you need any help or supplies. The thing that really struck us was our first morning waking up back at home in suburban Washington DC - it was really, really quiet. No macaws chattering or howler monkeys or cicadas or sound of the waves crashing onto the beach....we miss them! We would definitely go back to Casa Bambu and highly recommend it to anyone who wants to get away from it all comfortably. Perfect open-air get-away on surf break! We love this open-air bamboo house! It's clean, simple, organized and well-maintained. And it couldn't be closer to the Pan Dulce surf break! The owner Kirk is extremely helpful and knowledgeable about the area (28 years living there!) He will send a driver to pick you up at Puerto Jimenez (no need for a car) who will stop by the market and surf shop with you. Then Lida and Oliva will whip up amazing local fare for $5/person using whatever food you have in the fridge. We walked everywhere...to restaurants, waterfalls, hiking trails and other beaches. We watched the waves from our bedroom! This is an amazing location, and Kirk is a great host. We will be back! I've lived in CR for almost 10 years and haven't seen a prettier area. Beautiful setting and comfortable house. Welcome to the jungle. Look forward to my next visit. 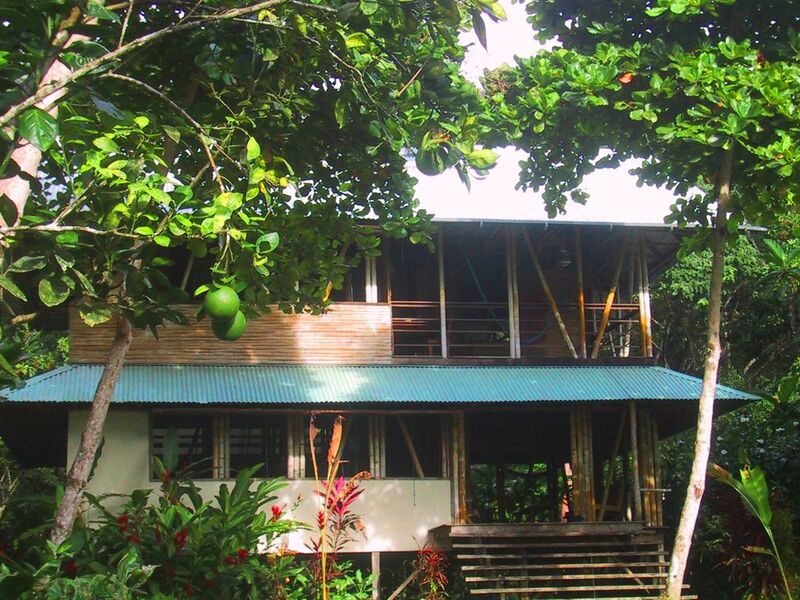 We spent two weeks at Casa Bambu, located in a beautiful setting, facing the Golfo Dulce on the Osa Peninsula. A large lawn, flowering shrubs, tall fruit trees border the property and invite the presence of macaws, white face and spider monkeys and all kinds of birds. but there were a few times when the surf was calm and if one walked to the left on the beach, water access looked easier. Dirt roads near the property lead to other near by beaches. Casa Bambu was built, according to the owner, 27 years ago and it is showing wear. We loved the owner's concept of a bamboo house - off grid, open air, a sense of living among the trees and shrubs surrounding the house. The kitchen was easy to use and clean up; the beds were pretty comfortable; the on demand water heater for the shower has seen better days and was difficult to adjust to luke warm which meant one had cold or very hot water to choose from when showering with nothing in between. The cushions on the sitting area furniture are pretty well broken down from wear and weren't the most comfortable for sitting and reading. The owner, Kirk, and his caretaker, William, were very responsive when something wasn't working. There when we needed them but otherwise gave us space. William took us on a wonderful hike into Corcovado. In some ways it was sad seeing the house just going down hill - of course this is in the "outback" of Costa Rica and I imagine up keep is difficult. However, I could not stop imagining how lovely Casa Bambu might once again be with just a little bit of routine maintenance - replacing the rusted window hardware, redoing the heavily patched mosquito netting on the beds, adding another wall fan on the upstairs sitting area to augment the ceiling fan which barely turns, and also another small wall fan on the downstairs sitting area would be very welcomed. The information in the house binder was dated and could use refreshing along with a new binder. William and Leda, the housekeeper, cleaned the house and changed the linens every 4 days, which was very appreciated especially when the weather warmed and the rains began. Kirk was extremely helpful before we arrived, sending abundant information, maps, even a grocery list. Staying at Casa Bambu allowed us to experience the surrounding natural world fully and up close. It was a memorable two weeks. During the 27 years we’ve operated Casa Bambu and its three sister houses on the same property, we’ve felt the need to respond to only a few of the 450 or so reviews we’ve received. Almost all have been overwhelmingly positive (all but nine have been 5-star), but when visitors have criticisms or complaints we want to be responsive. There were many criticisms in this review. I will respond in the order of appearance of some of them, but many of the criticisms can be chalked up to unfulfilled expectations on the part of the guest. As we make clear on our website, this is not a Marriott experience. We are in the jungle with the monkeys, off grid. If one wants a Marriott type experience, he should go to a Marriott type hotel. THERE are instructions for operating the shower posted on the wall next to the shower entrance. If one follows the instructions, the shower temperature is fully adjustable for the whole range from cool to hot. THIS observation was accurate. We were in the process of replacing the cushions in all four houses during this guest’s stay. We do this every few years. Please see pictures of the new cushions here on VRBO. WE are literally doing maintenance constantly to keep everything in good to perfect working order. It's point of pride at Casa Bambu that everything works as it should. Wir befinden uns direkt am Pan Dulce Beach, einer der besten Surfspots der Welt, speziell für SUP- und Longboard-Surfer. Weltberühmten Vogelbeobachtung, Kajakfahren, Regenwald-Touren, zu Fuß oder zu Pferd (einschließlich weltberühmten Corcovado Nationalpark), Golfo Dulce Bootstouren, Naturschutzgebiet Touren, unberührten Stränden, ist Puerto Jimenez 30 Minuten Fahrt und bietet mehrere Banken, Restaurants , Cafés, Diskotheken und Lebensmittelgeschäfte, können wir Ihnen mit großer Führer, sowie Unterkünfte in San Jose und im Land Reise gesetzt.